It is a celebration of Mumbai’s legendary film industry in 5 zones inspired by Bollywood blockbusters. Enjoy live entertainment, stage performances and flamboyant cinematic rides in an experience unlike any other. For the first time ever, you will live, learn and experience the kaleidoscopic world of Mumbai’s famous film industry, in the world’s first Bollywood themed park covering 1.7million square feet. Best-in-branded entertainment from three of the largest and most successful motion picture studios in Hollywood; DreamWorks Animation, Columbia Pictures and Lionsgate – complete your visit to a world of innovation and creative storytelling by visiting Motiongate Theme Park. After breakfast, day is free to enjoy all 04 theme parks. Overnight stay is at Lapita Marriott. Legoland Park & Legoland Water Park:- As part of Dubai Parks and Resorts, Legoland and Legoland Water Park are the ultimate year-round theme park destination in the Middle East. It is mainly for families with children from 2-12 years. LEGOLAND® Dubai and LEGOLAND® Water Park are hands-on experiences allowing families to take part in a full day LEGO® themed adventures through interactive rides, water slides, models and building experiences. Cost of optional tours, expenses of personal nature like tips, laundry, telephone charges, food and drinks not forming part of the group menus. Any items not specifically mentioned in “Includes” column. 1. What is the best time to visit Dubai? The best time to visit Dubai is from November to March. During the winter months, the city sees blue skies and primo beach weather. 2. What are the major languages spoken in Dubai? The major languages spoken in Dubai are Arabic and English. 3. What currencies and cards are accepted in Dubai? The currency used in Dubai is AED i.e. Arab Emirate Dirham. There are a number of ATMs throughout the city for the convenience of travellers. All major international debit and credit cards are accepted in most of the shopping malls, hotels and restaurants. 4. What is the voltage across Dubai? The voltage is 220 volts and most North American appliances will require transformers, while small electronics will just require adaptors. It is therefore recommended, if you are going into accommodations that require appliances, that you buy large appliances in UAE, and not ship them from home. 5. What kind of clothes do I wear? Dubai is easy going compared to other Muslim countries. It is advisable to cover yourself and respect their culture. 6. What are the must try delicacies in Dubai? Some must try delicacies in Dubai are Hummus – a famous dip made from chickpeas, olive oil, lemon juice, tahini paste, salt and garlic. It is served with other dishes like Shawarma and pita bread. It is also a perfect appetizer. It is very unique in taste. Carrot cake - They are loaded with carrot shaving and walnuts, and bowing beneath a solid slathering of cream cheese frosting. Falafel - Falafel is fried fritter made up of a mix of mashed chickpeas combined with assorted spices, deep fried till crisp and served in bread pockets. Maamoul - Is an Arabian pastry, stuffed with a choice of dates, walnuts, almonds and pistachios, then moulded in shape and baked with sugary coating. 7. Is tipping mandatory in Dubai? Tipping is not mandatory in Dubai, it is always expected. 10-20 Dirhams is the ideal tipping amount to porters, waiters or bellboys. 10% of the total bill amount should be given as tip in restaurants and cafes. 8. Are there any drinking restrictions in Dubai? The minimum legal age for drinking in Dubai is 21 years. Having an valid, original age proof while entering a bar in Dubai is mandatory. Having/consuming/buying alcohol without a valid licence is considered to be a punishable offence. Consuming alcohol in public places is strictly prohibited and is a punishable offence. 9. Which items I cannot carry to Dubai? The list of items you cannot carry to Dubai are: Any kind of narcotic drugs. Cooked and homemade food Trees, plants, soils. PETS. Any printed material that contradicts Islam. 10. Is travel insurance a must? Travel insurance is must for all medical emergencies. 1. Dress conservatively in public areas like malls and beaches. 2. Do be aware of opening and closing times. The weekend in Dubai is Friday and Saturday. 3. Do be careful while crossing roads. 4. Do be respectful of people. 1. Don’t point with your finger or use disrespectful gestures. 2. Avoid public display of affection. 3. Don’t take photos of locals or government buildings without their permission. 5. Using bad or foul language, making obscene gestures and showing disrespect to Dubai or its religion or its leaders are all to be avoided. Doing any of these could land you in jail. 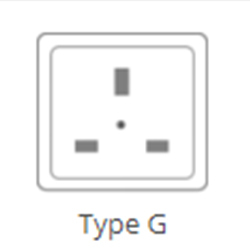 United Arab Emirates uses 230V, 50Hz with socket and plug Type G.